Our historic last “Pre-kid Caribbean cruise” (taken several months before our unborn baby was to arrive) officially began on the edge of a waterfall-fed swimming hole in Grenada. Our hosts, John and Caroline Charnley, and my Caroline (three months pregnant) were already swimming in the cool, fresh water, but of course, I just had to jump in from the “cliff” (about 10 feet high) above the pool. I guess some things will never change. 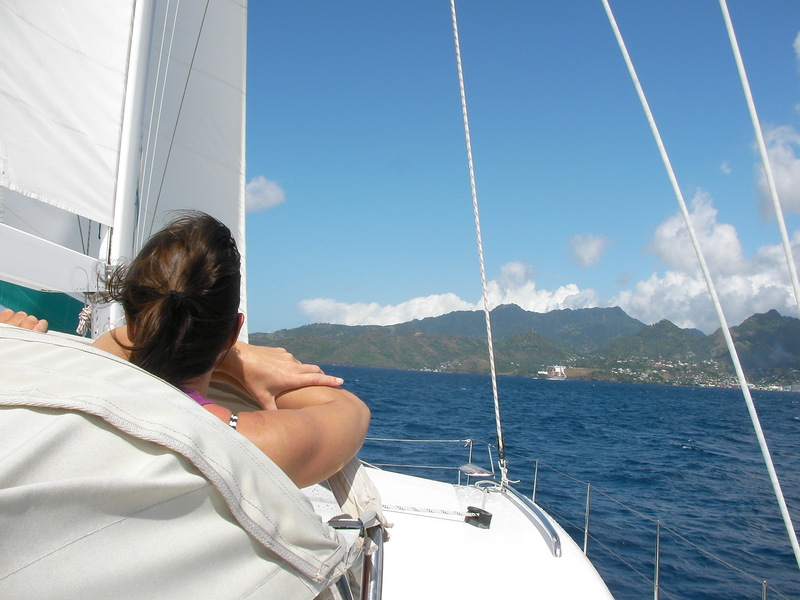 What made this refreshing little dip even better was knowing that we’d traded in the cold northern winter for a sunny, breezy, upwind romp through the Windward Islands from Grenada to St. Lucia aboard the Charnley’s 50-foot cruising cat Discovery Magic. John and Caroline not only own the boat, they also own the company—Discovery Yachts—that builds it and several other offshore passagemakers, so there was a dual purpose to our cruise. Of course the plan was to relax and stop at all the cool spots in between Grenada and St. Lucia, but the boat also had to be in Miami, 1,500 miles away, in time to be on display at the Miami Boat Show. That meant we had to keep moving (into the prevailing trades) and we had to stick to a schedule too, so, we’d be leaving the next morning. After our refreshing dip, we visited a wonderful old nutmeg processing house (most of the world’s nutmeg comes from Grenada) that’s still in operation in the fishing village of Gouyave, a colonial distillery that’s been turning sugarcane into rum since gentlemen wore wigs and triangle-shaped hats in the 1780s, and some friendly monkeys in the Grand Etang Forest Reserve on the way back to the boat in St. George’s Harbour. Then it was Christmas Eve, and we peacefully scanned the starlit sky for Santa’s sleigh from the comfort of the tramps at the bow. The only slightly-less-than-perfect element of our passage was the “beating” to windward part, but it proved to be hardly a hardship. Even when the trades got up to the low 20s in the exposed passages between the islands, we stayed dry and comfortable at the helm station (the seat is wide enough for two) and at the various other spots in the cockpit and main saloon, while Otto the autopilot kept us on course. 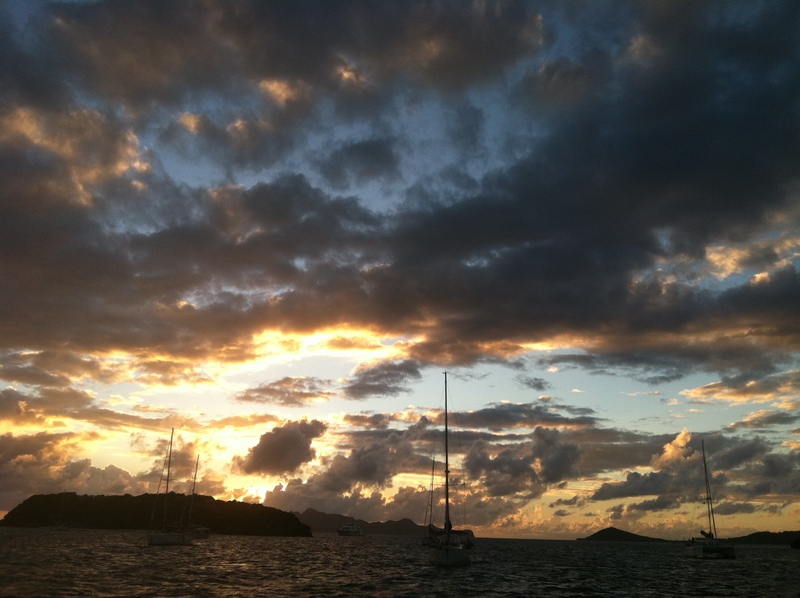 And we all agreed that our little upwind “passage” between Grenada and the southern Grenadines was a refreshing romp. Even our intrepid pregnant crew member, who’d been wrestling/suffering with morning sickness on dry land, was loving the brisk breeze—as long as she stayed up on deck, and looking forward, at the nav station. 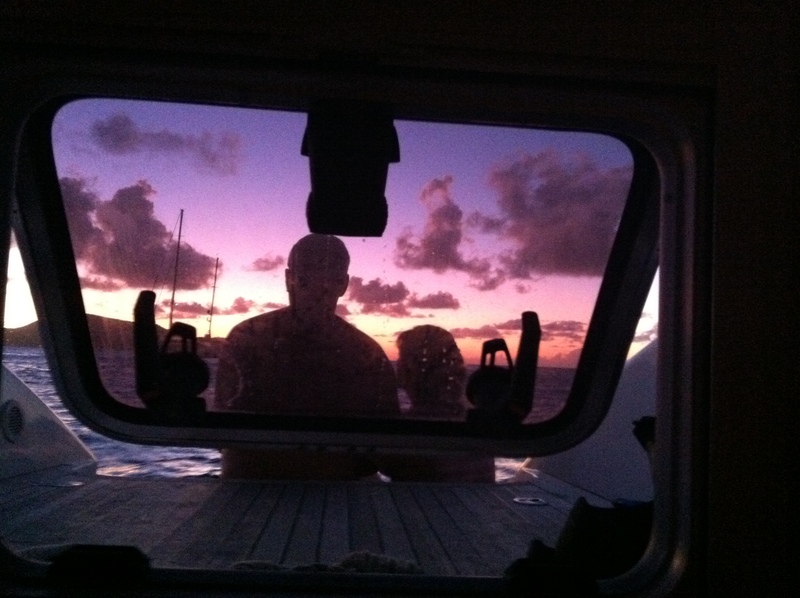 The passage was long enough to get us reacquainted with the restorative powers of being “offshore,” but short enough to ensure we had plenty of time to drop the hook, swim in the clear water off the sterns, loll about in the warm white sand on tiny “Petit” St. Vincent, and feast on a meal made up of steaks Caroline and I brought, um…smuggled, all the way from the states. We were in the groove now and things were only getting better. Next stop, the ultra-photogenic Tobago Cays. But we had to clear into the sovereign nation of St. Vincent and the Grenadines first. At least we had to try. A quick run ashore to the customs office on Union Island provided a great opportunity to see the sleepy little village there, but we were hardly surprised to find the customs office was closed for the weekend. So our bureaucratic conscious was clear when we made our way over to the Tobago Cays where the smiling local “businessmen” in brightly painted boats with powerful outboards descended upon us in the channel like we held the keys to the kingdom. They were friendly, and only wanted to help (and earn a little money), but they were also quite numerous, pretty persistent, and their constant buzzing around imbibed the crowded anchorage with a certain frenetic energy. We enjoyed the snorkeling and the view of this most popular anchorage, but not so much as to alter our schedule. Plus, Mustique, the ultra-exclusive enclave of the likes of Mick Jagger and Princess Anne, was our next stop and promised to be a bit more chill. We were off with the warm, pink sunrise in the morning. By now we were used to the rhythm of the trip. Up early. 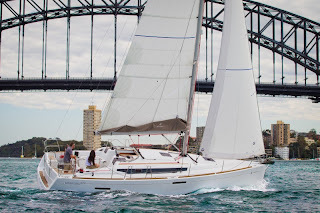 Sail upwind for all or a portion of the morning, drop the hook, swim, eat, visit shore (not necessarily in that order), repeat. Sounds pretty good, doesn’t it? Well, that’s exactly what we did after we left the Tobago Cays. The trades were a bit stiffer than they were on our trip up from Grenada, but not too stiff. 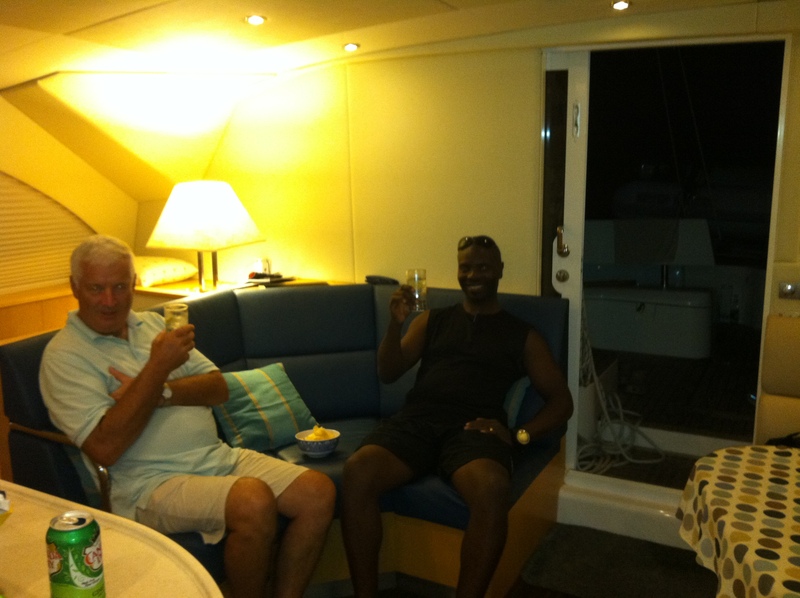 The seas were up a bit too, but we were only exposed to open ocean rollers for a short while before we tucked into the lee of Mustique and grabbed a mooring in Britannia Bay. And no, we didn’t see Mick or any of the Stones, but we did grab lunch at Basil’s Bar (where Mick has been seen and photographed) and take in the sights in this charming little village. But we’d still not cleared in yet and we wanted to get to sweet, sweet Bequia for dinner (and clear customs the next morning), so we kept on trucking to the north. 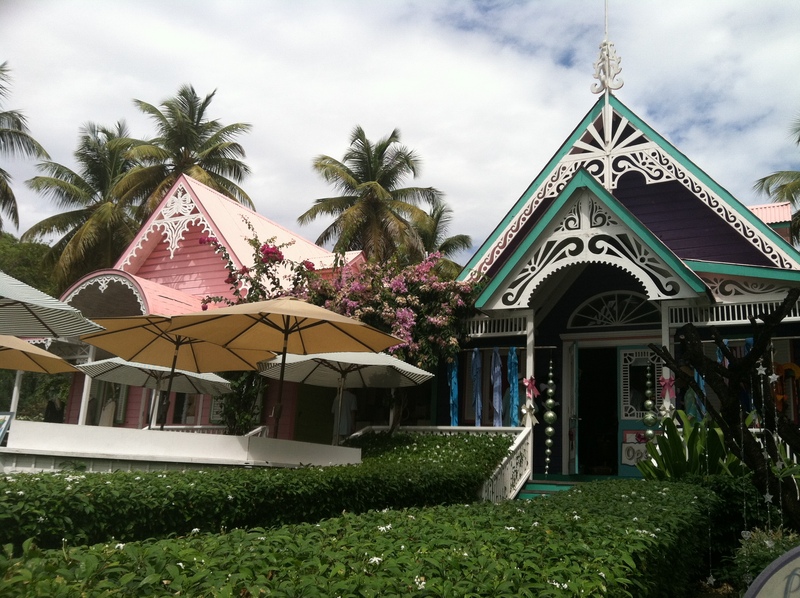 For me, there was something familiar about Bequia. Maybe it was the mellow vibe that comes from a cool mixture of tourists, locals, and sailors in town, or the way the houses ring the inner harbor, but I couldn’t help being reminded of the Canadian Maritimes in the Caribbean. Cool. We had a great shore-side dinner when we arrived and we were able to get all our chores done the next morning too. John and Caroline successfully waded through the crowd to get our papers stamped in the customs office, while my Caroline and I were able to knock the last needed provisions off the list. It was amazing to feel so curiously “at home” in this place we’d never been before, but we did have a schedule to keep, so, we were off to St. Vincent as soon as we got back to the boat. 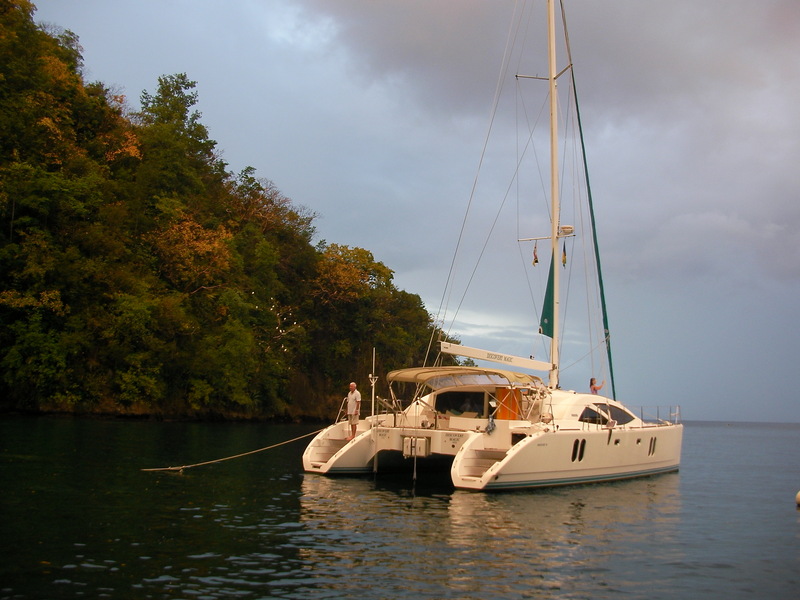 Up until our trip to St. Vincent, the cruising guide and our collective experience ensured that we had a pretty good idea of what was waiting for us at each of our planned destinations, but that didn’t really apply to St. Vincent. None of us had spent any time there, and the cruising guide seemed to describe lots of cool, but deep anchorages on the western side of the island that required long mooring lines tied to palm trees on shore. 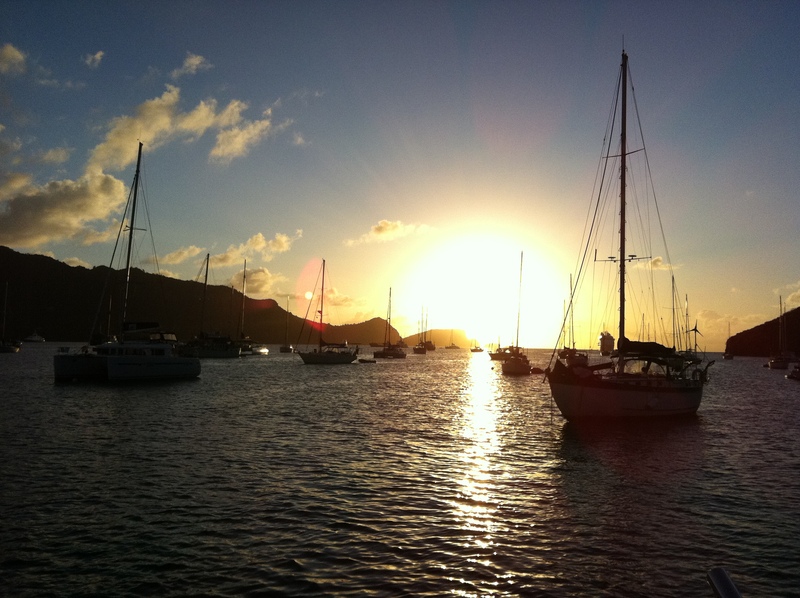 It was all a bit of a mystery to us as we made our way north from Bequia. 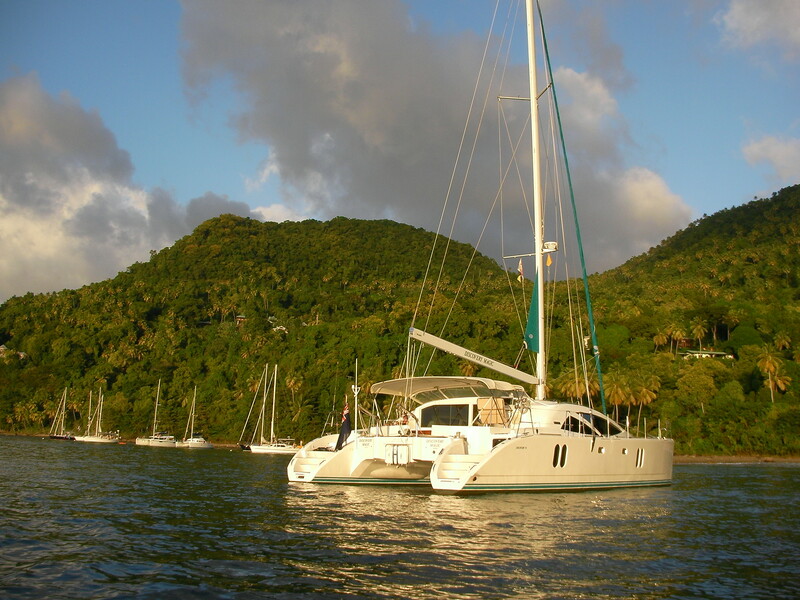 And where we were going to spend the night (so we could be in a good spot to make the longish sail to St. Lucia the next day) continued to be a mystery even as the small bay that we’d been reading about in the cruising guide opened up before us. We saw that several boats had already backed into the beach and secured long lines ashore, and then Arthur appeared. “Follow me,” he said with a gap-toothed smile. “I’ll help you get your line ashore.” He’d obviously done this before, and we hadn’t, so we accepted his kind offer and happily paid the going rate of $10 EC for the service. And not too long after that, we were snugged down, with a long line tied to a palm tree on shore, into one of the more captivating anchorages I’ve ever been to. It wasn’t that the scenery was the “best” or that the water was “super clear,” it was more of a vibe. Cows and goats traipsed around on the beach and what appeared to be an entire colony of white birds curiously, and almost silently, roosted in the trees nearby. And when Arthur picked and delivered some fresh limes for us from a tree on shore, we all got a taste of the magic of cruising that happens when the surprise spots turn out to be the most special. And for us, new-parents-to-be, all the good feelings from this trip were magnified because our days on the boat (and our days of only being a couple) were quickly, though happily, coming to a close. But we could have never imagined the coolness that was waiting for us in St. Lucia. By now we were old hands. Up at 0630. Lines and fenders stowed. Toast buttered. Sails set. Autopilot engaged. 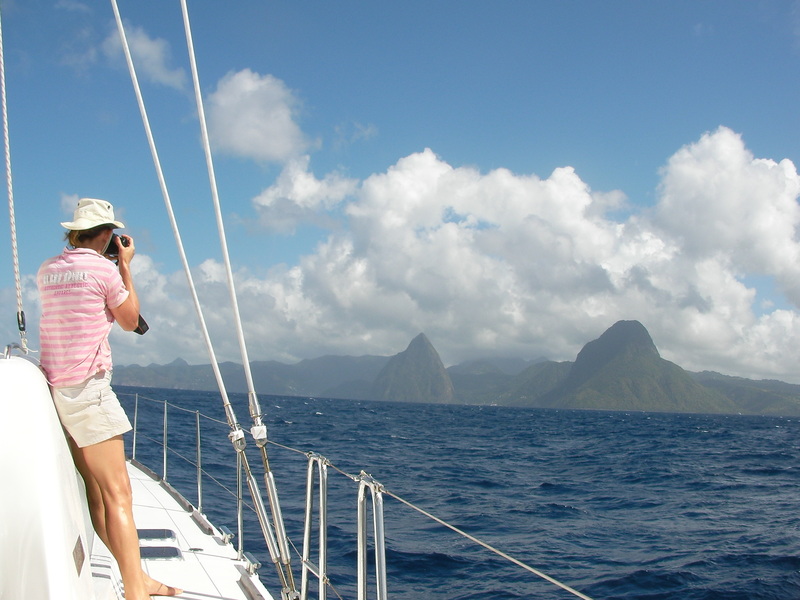 And then we watched as St. Lucia’s most significant landmarks—The Pitons, Petit and Gros—loomed over the horizon and continued to grow until they towered over us as we pulled up at St. Lucia Marine Parks and Services mooring at the base of the nearly 3,000-foot tall Petit Piton. Unlike our surprise anchorage from the night before, we’d read all about St. Lucia, and the town of Soufriere, and especially the Pitons and St. Lucia’s hot springs. So, once we’d gotten the boat safely moored, we talked to “Bob” about possibly setting up an island tour and a trip to the hot springs…but honestly, we weren’t so sure about “Bob.” “Bob” was an option, but we all agreed, not the only option as we geared up for the requisite swim and snorkel trip in the dinghy. And then the cruising gods really smiled on us. 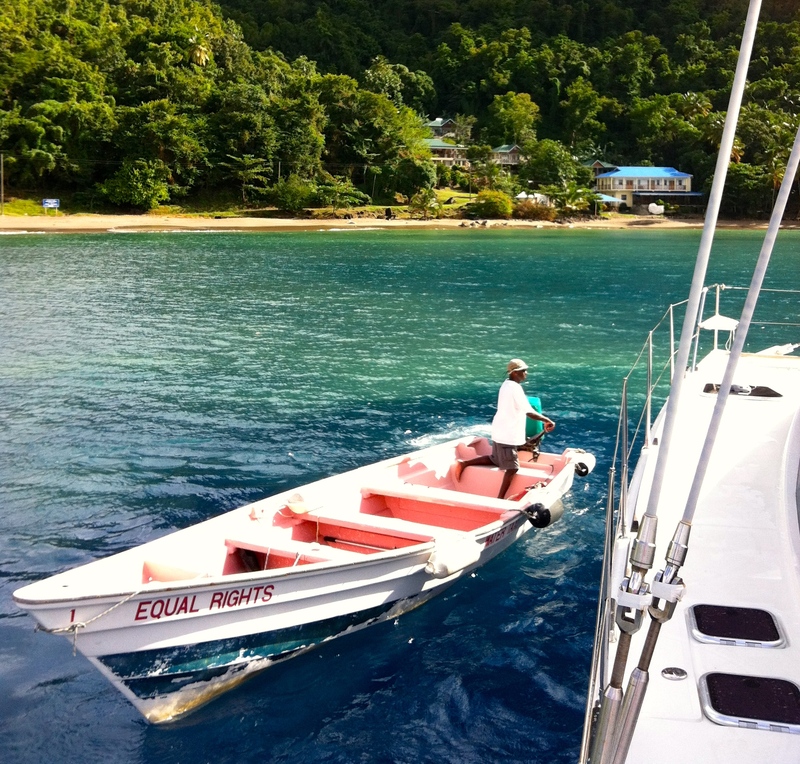 We’d returned from snorkeling and were planning for a dinner onshore when Jason from St. Lucia Marine Parks and Services pulled up alongside us to collect our mooring fee. “How we all doing this fine evening?” he said with a smile and a sweet St. Lucian accent. We’d never have agreed to a mission like that with Bob, but Jason was an entirely different story. And he picked us up right after dinner. We piled into his tiny Suzuki 4×4 and not only did we get to spend a fantastic and utterly unique evening under the stars in St. Lucia’s volcanic hot springs (they weren’t “open” but Jason knew the guard), we got to know a truly special person. He shared of himself and what it means to be a native St. Lucian that was both educational and inspirational. And even more than that, he was fun. He was a friend! What a perfect way to end the trip. We sailed over to Marigot Bay the next day, and flew back home the day after, but I know the story we’ll tell when the baby is old enough to appreciate it. Can Sunglasses made from ocean plastic Help People, the Planet, AND look cool too?